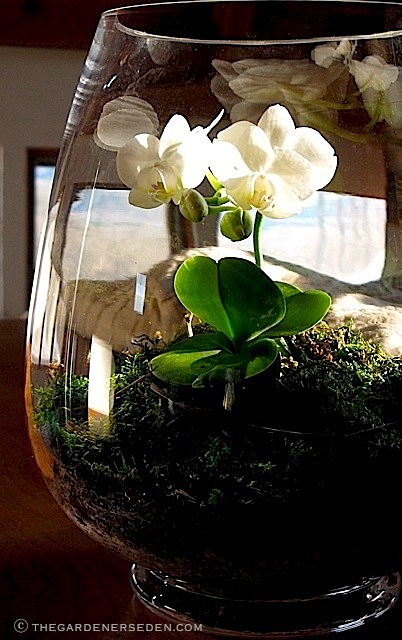 A tiny Phalaenopsis orchid , (‘The White Moth’) , displayed in an open terrarium lined with pea stone/charcoal mix, and filled with a bed of bark, sphagnum and sheet moss. Click here for related post. 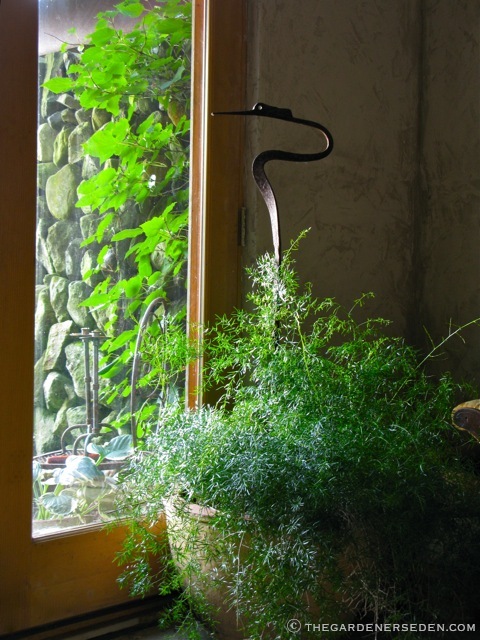 I live in Vermont, and from November through April, I spend most of my time inside. 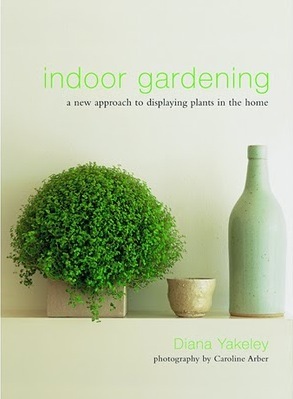 When the weather turns cold, houseplants, terraria and windowsill herb gardens turn my home into a virtual Indoor Eden. 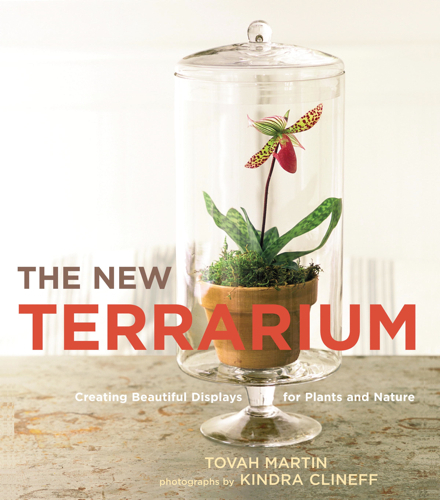 Gardening indoors can happen at all levels, from a simple pot filled with a barrel cactus, to an extravagant, wardian case terrarium, to a small conservatory, to a complete greenhouse set-up. 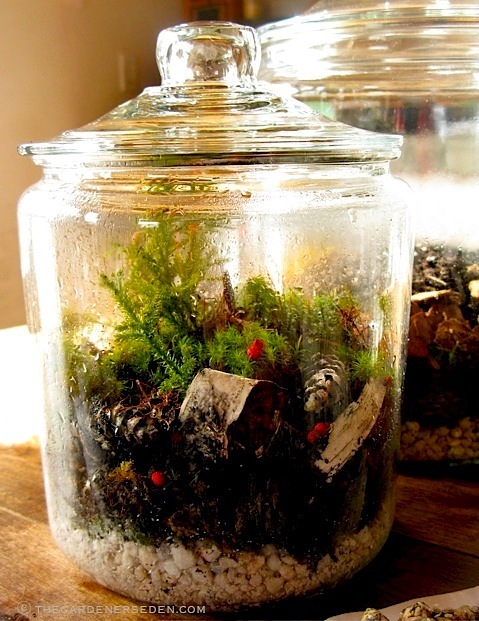 In this space you will find creative ideas and projects, resources and products, to help you create an indoor oasis all your own. 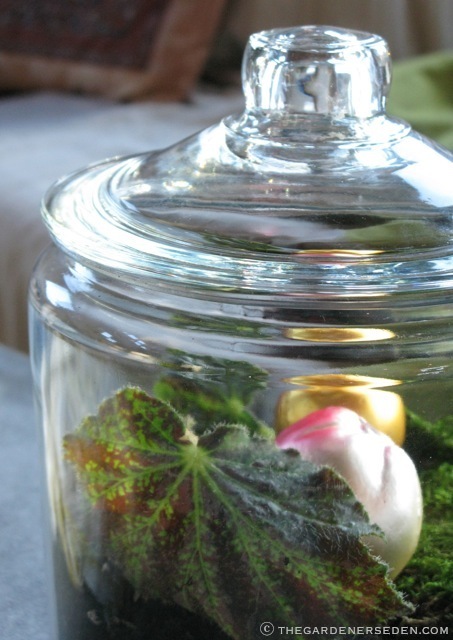 Below each photo, you will find a link back to a post or site relating to each project, resource or product. 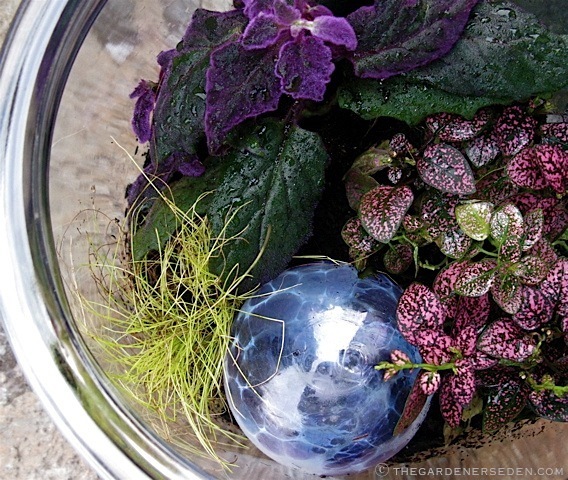 Open bowl-style terrarium and a blown-glass bulb amid pink polka dot plant, (Hypoestes phyllostachya), purple velvet plant, (Gynura aurantiaca), and golden hair grass (Deschampsia flexuosa ‘Tatra gold’). Click here for related post. I over-winter many tender plants in my Secret Garden Room (which is really just a glorified basement. 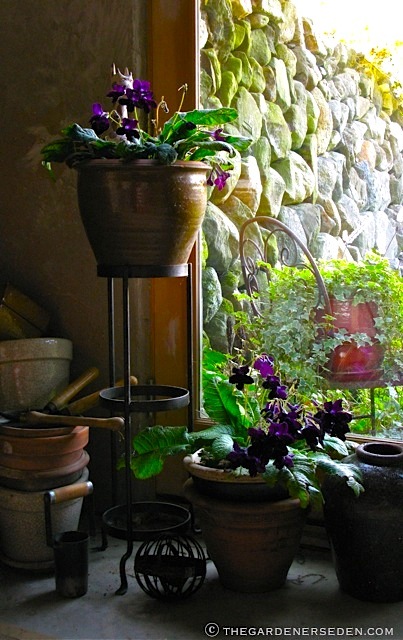 I used odd & ends, flea market finds, old cast-offs/unwanted furniture and elbow grease to turn the unused & unattractive space into a shady, garden oasis for all seasons. Click here for more photos of the Secret Garden Room). 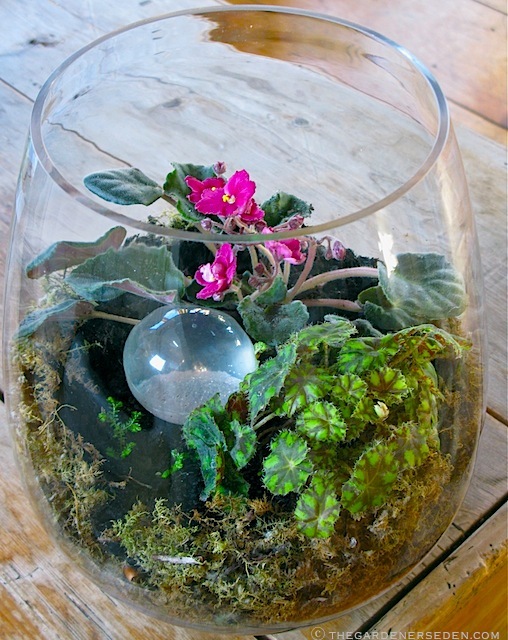 A terrarium-bowl filled with Begonia ‘Kit Kat’, Saintpaulia, (African violet), Selaginella kraussiana, (Club moss), and a sparkle-ball accent. Click here for related post. 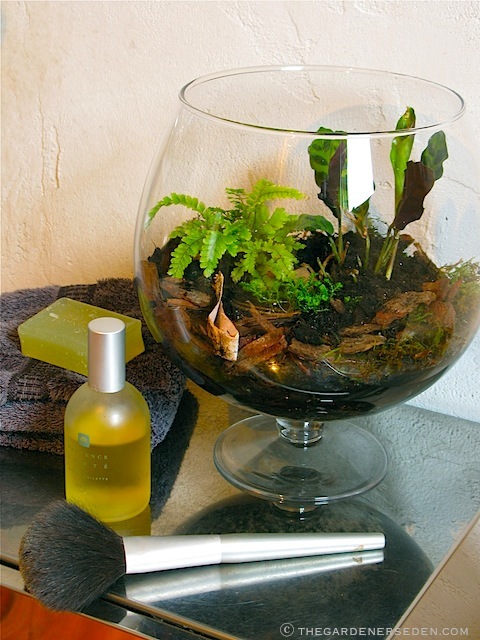 A pedestal-bowl terrarium filled with Adiantum, (Maidenhair fern), Calathea lanceolata and Selanginella kraussiana, (Club moss), warms up a modern metallic vanity in the powder room. Click here for related post. 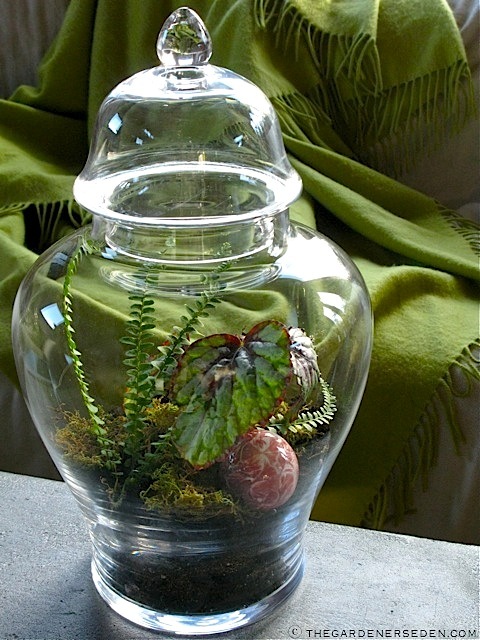 Apothecary Jar Terrarium: Containing Nephrolepis cordifolia ‘Duffii’ and Begonia ‘Trade Winds’ with Sphagnum moss and Ceramic Ornament. 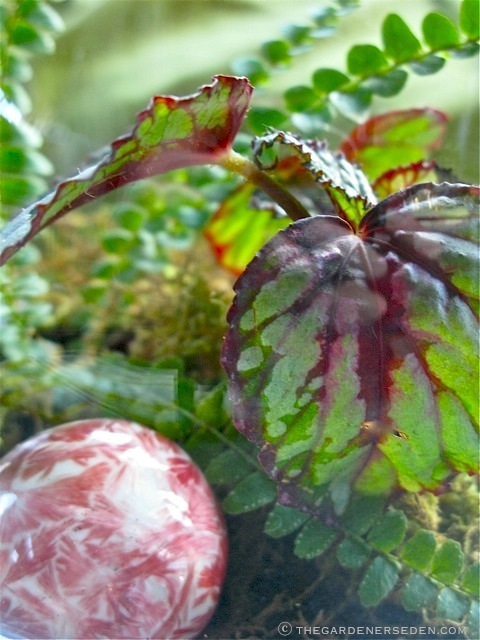 As with Outdoor Garden Design, Adding Objects to Terrarium Vignettes Enhances Color and Textural Interest. 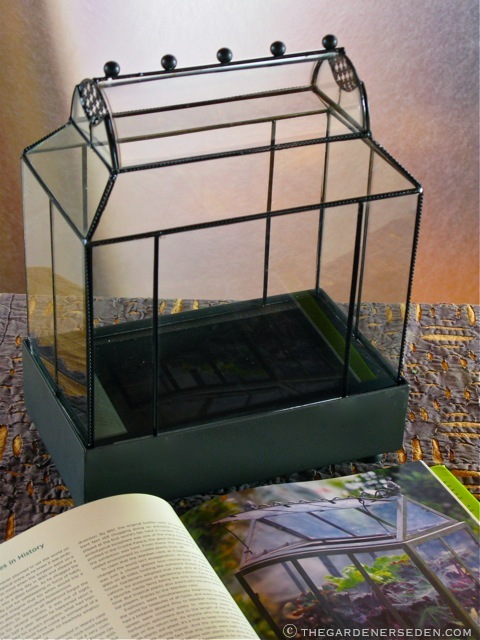 My tabletop barrel roof, glass/metal Wardian case is a true gothic beauty; just waiting to be filled on the next rainy weekend ! 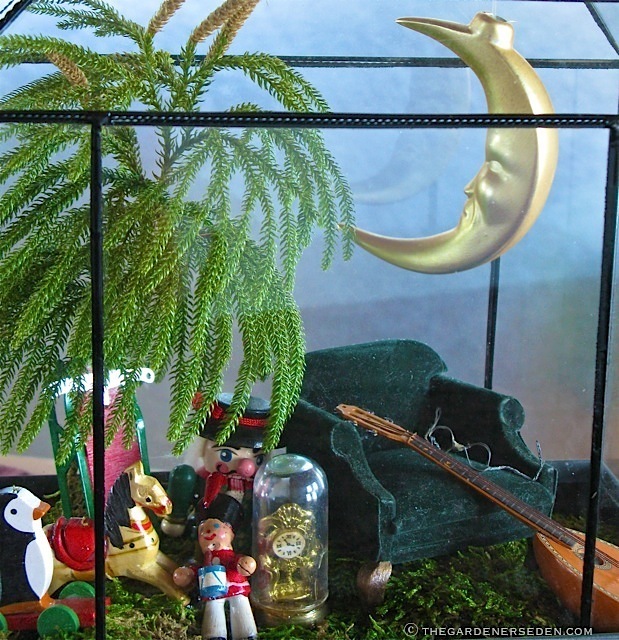 This Nutcracker Suite Terrarium: A Wardian Case Holds a Moon Rise and a Collection of Christmas Toys Gathered Beneath the Tree (Lycopodium obscurum aka Ground Pine Club Moss). 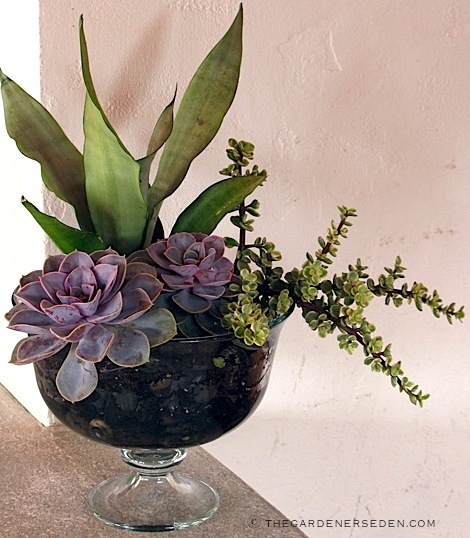 A modern interpretation of the classic terrarium: non-traditional, dramatic succulents contained within a delicate glass pedestal bowl. 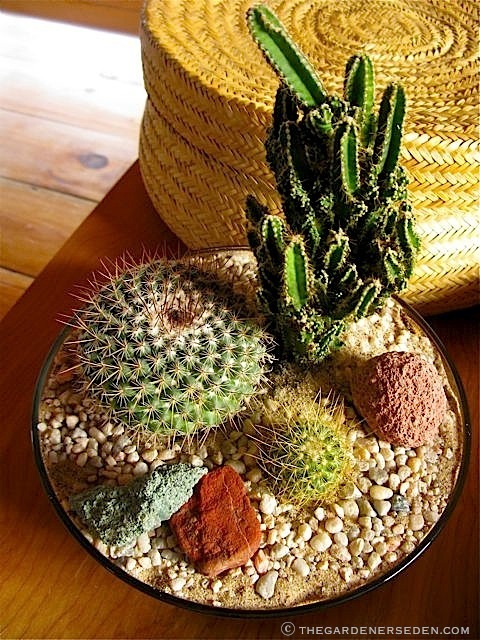 Click here for related post..
Dry Garden with Barrel Cactus and Fairy Castles. Click here for related tutorial post. 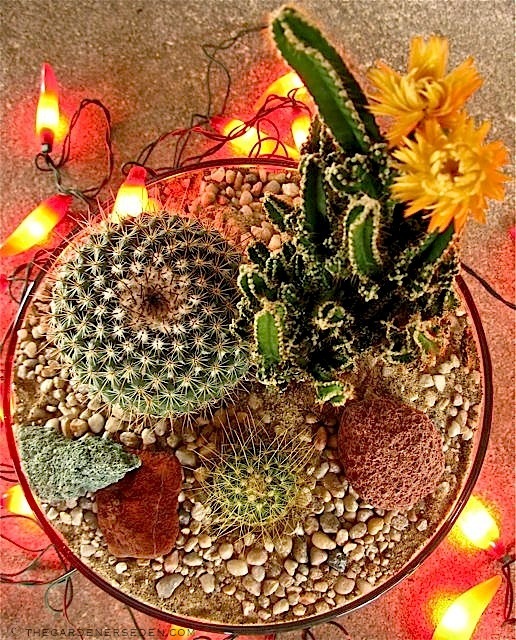 Use the cactus bowl as a party centerpiece, accented with chili lights and decorative straw flowers. Click here for related tutorial post. 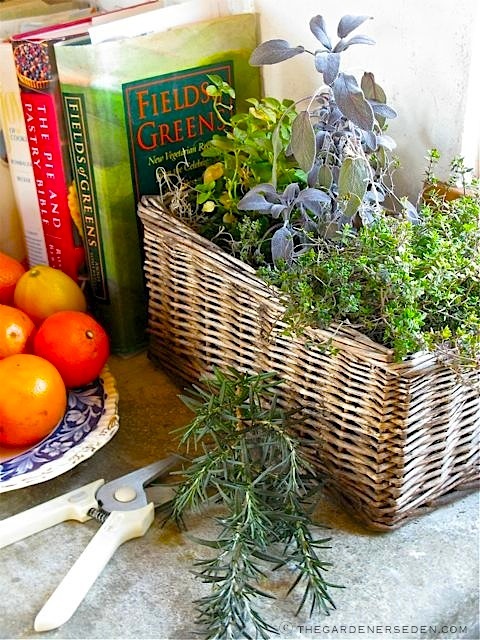 Kitchen Windowsill Herb Garden. Click her for related post. 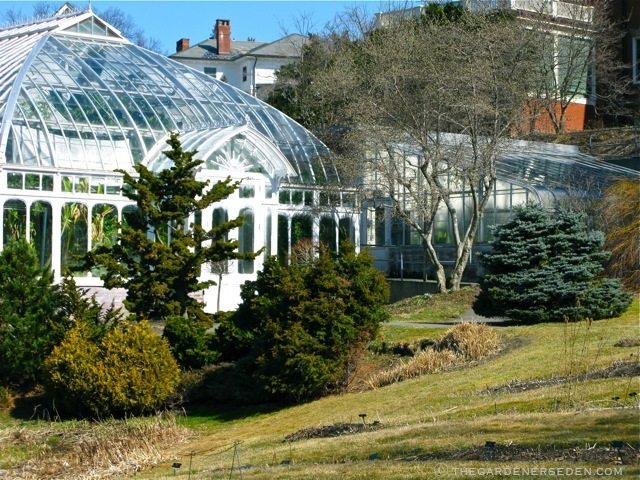 The Lyman Conservatory at Smith College. 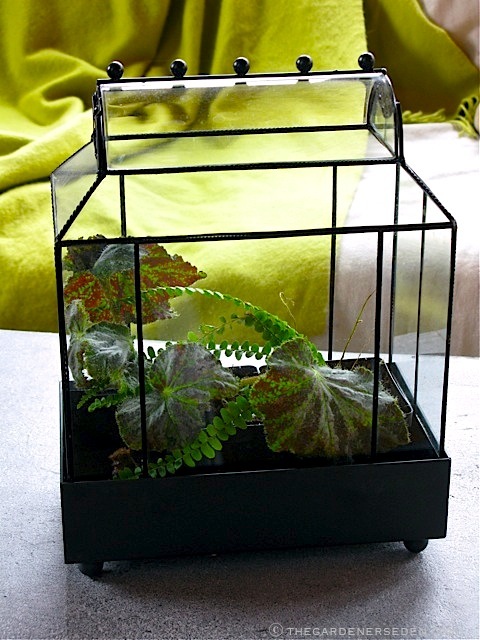 Click here for related post. My ‘conservatory’ space is shady. 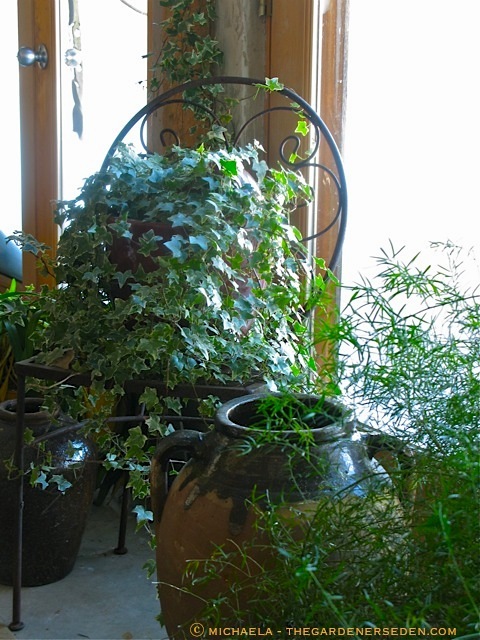 I grow ivy (like the Hedera helix ‘Glacier’ pictured here) ferns, primrose and other shade-tolerant plants in this space year-round, and over-winter many tender plants there. 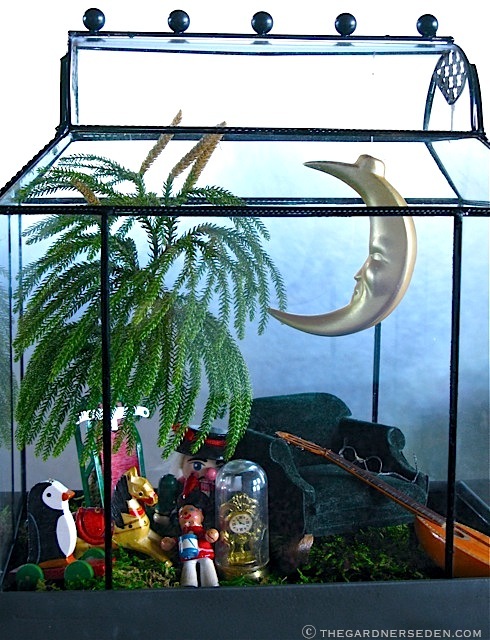 I call it the Secret Garden Room, and it’s located in my basement entryway. 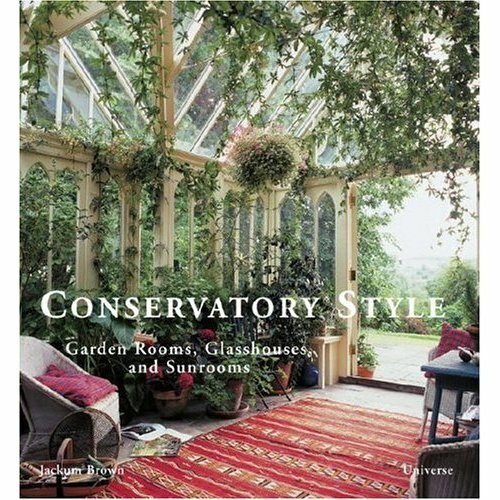 I replaced the barn doors with a wall of glass, French doors to bring in light and make the space attractive and useful indoors and out. 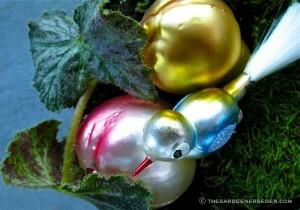 See more photos of the Secret Garden Room here. 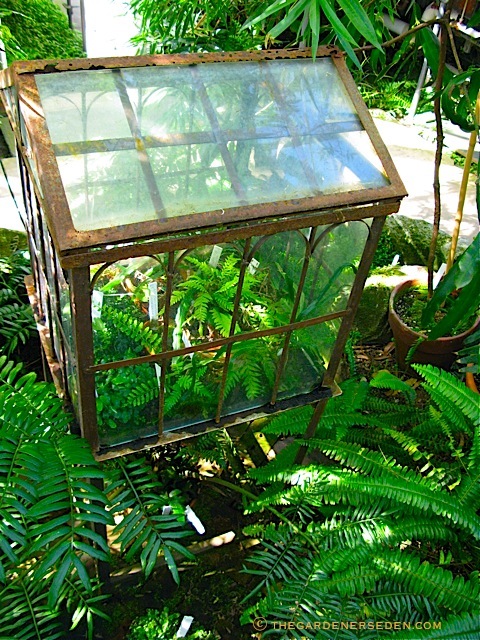 In winter, patio and deck plants become houseplants. 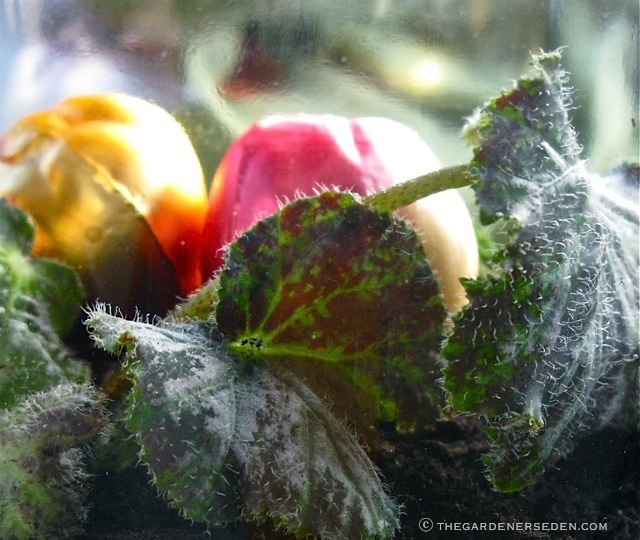 Sometimes uninvited guests —like aphids and scale— hitch a ride inside during the migration. 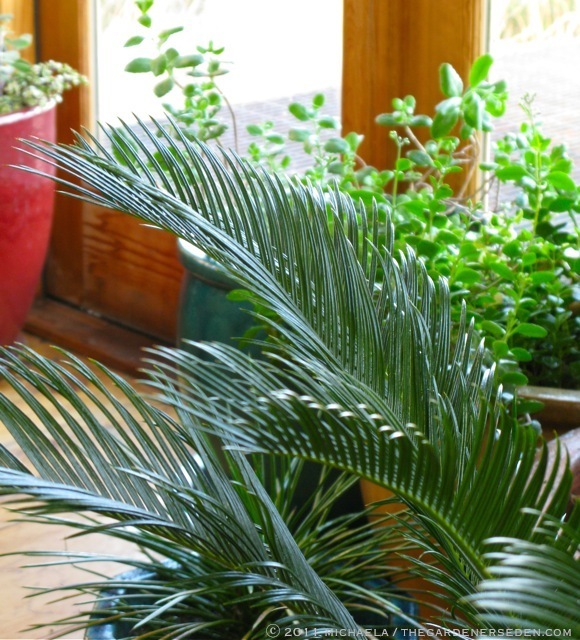 Click here for a few tips and helpful resources for dealing with insects on plants indoors. 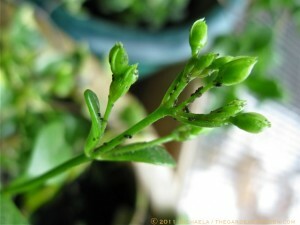 Aphids on Kalanchoe mangini. Click here for related post.